Been busy as….. Painting a storm for 29 faces, AJJ – living beings and Mix it Monthly - trees! This is Sara; she is a beauty, loves to dress up, wears flowers and ribbons, and goes out on the town frequently. However, despite being so-called ‘popular’ she is very lonely, if you look hard enough you can see into her soul through her eyes and see the sadness. I think she has been hurt a lot. I used gouache and acrylics; it took me all week to get her how I wanted. This picture I did for 29 Faces and AJJ – Living Beings. If you want to see the faces I posted during the week go here. They are about my cat Bro. This first one is his relationship with dogs. He has a love hate relationship. He keeps his distance as he has had one or two run in with them. But I have caught him terrorizing or perhaps tantalizing the neighbour’s dog. They have a one of those yappy terriers, and it is often in the front window when they go out. Bro likes to sit in the middle of the lawn staring at it while it goes berserk, yapping jumping at the window. I swear he is laughing! Bro pretends to hate birds. Proof of this was witnessed by the one legged blackbird that frequents my back garden looking for worms. It disappeared for a while and I thought it hadn't survived the winter. However looking out the window I saw the bird on the foot path to the washing line. Around the corner came Bro. He sat down as the bird continued to hop about. They were only a foot apart! He stayed there till it flew off. He got a great big hug from me. I used acrylics in both pictures. For the trees they are wearing their spring outfits as it is spring here. (It has arrived at long last!) I haven't used the colour scheme provided by Connie but will for next Tree picture that I am working on. Bro taking his early morning stroll in the garden! Below Bro guarding the property on the carport roof! Oops it needs painting!!! Well if you got this far thanks for visiting and have a wonderful creative week. and Mix it Monthly hosted by Connie. So so lovely all here today Sharon! Oh my goodness what a wonderful jammed packed post of yummy beauty! I love them all but Bro peeking over is so adorable and I love love love Bro and the Bird...gorgeous and fun!! The girls are beautiful too!! Can't wait to hear the cow story and more!! Love where your art is going..it makes me sooo happy!! Bro and the Bird should also be a line of cards!! You are so inspiring! Wow, you have been busy!! 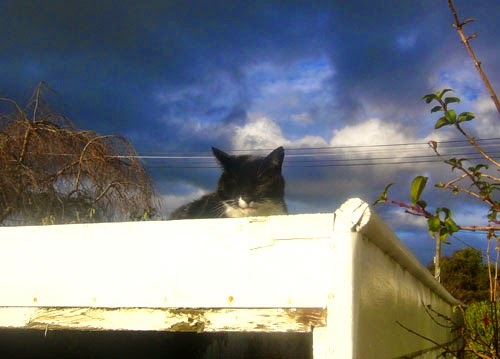 Our kitty 'guards' our house from the safety of the living-room window sill... she's the smallest kitty in the neighbourhood! So lovely post from you! Especially Bro and Bird. The first painting of a sad story. You have expressed all in her eyes very clearly. 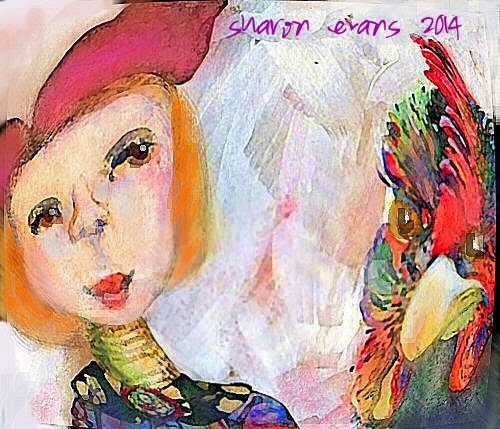 Great art Sharon! 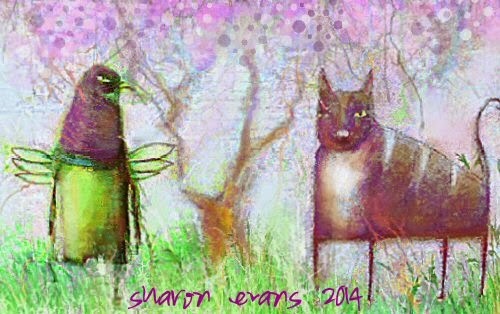 I love that cat and bird piece so much, a real favourite! What a cute little farm girl! I so love your faces, and the stories that go with them! Sara indeed looks very sad, and I love the painting of Bro and the blackbird. So sweet of him to not go after that bird. These are wonderful paintings Sharon. I really like your style and Bro is lovely-i love that he didn't harm the one legged Crow! I love the perspectives you use, they make the wonderful faces even more interesting! Love your work Sharon. You have a unique style. Happy day to you. Oh my so much wonderful art to see! I especially love the first two-and the angle of the rooster is very cool! 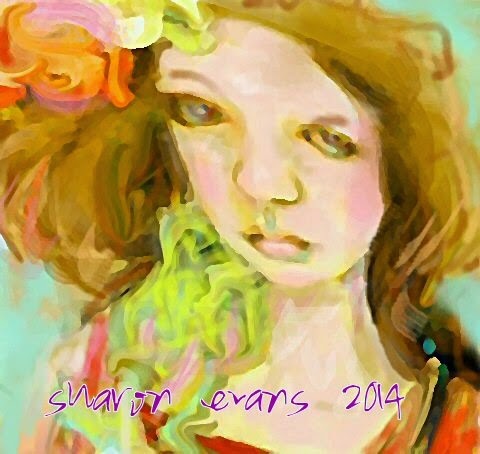 wonderful art this week Sharon, I'm drawn to the lovely Sara. 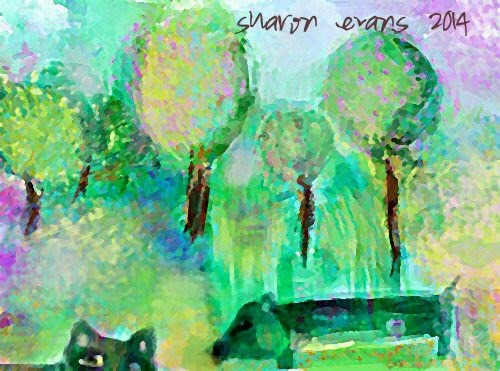 Love your art this week, Sharon. I have a friend who was attacked by a rooster when she was a child and is still scared to death of chickens/roosters. Oh I love this post! Wonderful paintings and entertaining stories! Thank you for sharing! I love your portraits, as well as your trees page. I also enjoyed reading about your farm days, because I used to spend the Summers at my grandmother's ranch, where I was sometimes chased by her geese - LOL! Have a blessed week, my dear friend! Ah, so whimsical. Your work is just wonderful. I also love the way you write. Oh Sharon, you are a prolific painter. I'm so impressed and inspired by your art. Some of the challenges out there make me hyperventilate just thinking about them. Your artwork is wonderful and tells such great stories too!